An unmanned Japanese space cargo ship met its fiery demise overnight when it intentionally re-entered the Earth’s atmosphere late Tuesday (March 29) one day after its departure from the International Space Station. The robotic spacecraft, an H-2 Transfer Vehicle called Kounotori 2 (which means "White Stork" 2), was destroyed to dispose of itself and its cargo of space station trash after a successful two-month mission to the orbiting laboratory. Along with the station trash aboard Kounotori 2, a high-tech sensor onboard the cargo ship successfully monitored the hot and fiery details of the spacecraft’s plunge to destruction into the South Pacific Ocean. It related its data via satellite to researchers for later analysis. The spacecraft also carried three paper cranes folded by the space station's three-person crew as a symbol of hope for the victims of the massive Japanese earthquake and tsunami that struck the country on March 11. The sensor on Kounotori 2 – a small and autonomous device called the Re-entry Breakup Recorder, or REBR for short – recorded temperature, acceleration, rotational rate and other data during the spacecraft's high dive into Earth’s atmosphere. Recovery of the device is not planned. Ailor told SPACE.com that analysis of the data will take six to eight weeks. 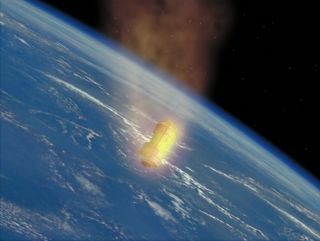 The Aerospace Corporation designed REBR to collect data during atmospheric reentries of space hardware in order to help understand breakup and increase the safety of such reentries. The REBR project was supported by the U.S. Air Force, NASA, and the Boeing Company. The first flight test of the small, autonomous device was coordinated by the Department of Defense’s Space Test Program. A second test will be REBR’s reentry aboard the European Autonomous Transfer Vehicle 2, called Johannes Kepler, in early June. Kounotori 2, also known as HTV-2, was the second disposable H-2 Transfer Vehicle built by the Japan Aerospace Exploration Agency (JAXA) to ferry tons of cargo to the International Space Station. The first HTV spacecraft, HTV-1, visited the station in 2009. "The HTV-2 carried various important cargo, including spare units of the external ISS system and potable water for the crew, which has been mostly transported by the space shuttle up to now," JAXA President Keiji Tachikawa said in a statement. "I believe that this success proves that the HTVs are reliable transportation vehicles essential for maintaining the ISS, and that Japan, as an international partner of the ISS, is eligible to play an important role for ISS operations." The spacecraft are about 33 feet (10 meters) long and 14 feet (4.4 m) wide. They can carry cargo inside a pressurized compartment – which astronauts can retrieve after docking – as well as haul spare station parts on an unpressurized pallet to be retrieved by a robotic arm. JAXA's HTV spacecraft are part of an international robot spaceship fleet that regularly resupplies the space station. Russia's unmanned Progress spacecraft and Europe's ATV vehicles also make supply shipments. The Kounotori 2 spacecraft launched in January and arrived at the station on Jan. 27. The next HTV spacecraft is expected to fly in January 2012.